Great for Homes, Shops, Stores and Clinics! 10X more powerful than a candle and does it without the flame! Sophia Gift Set includes: User guide, funnel, standard stone/wick, snuff cap, 16oz fragrance and lamp. Choose your 16 ounce free fragrance above. The stone: To keep your Sophia Fragrance Lamp performing at its best, you should replace the stone every three to six months. Why does our lamp disperse so good? Why is it safer than a candle? Well, the answer is catalytic combustion. Catalytic combustion is used in industry to consume harmful combustibles. One common known example is the catalytic converter in automobiles. We have taken the unique properties of these catalysts and used them to create our lamp stone. One of the most amazing properties is the catalyst’s ability to consume a combustible without igniting it. This means that once the flame is blown out it cannot ignite any combustible liquid or gas. What does this mean? It means that if our lamp should accidentally be broken, the catalyst is burning at too low a temperature to ignite the fragrance. Candles have a flame temperature of around 927 degrees Celsius or 1700 degrees Fahrenheit. Our Sophia Stone burns at approximately one fourth the temperature of a candle. So, not only does our Sophia Lamp out perfume any candle it is also much safer. Why does our lamp disperse so well? Why is it safer than a candle? Well, the answer is catalytic combustion. Catalytic combustion is used in industry to consume harmful combustibles. One common known example is the catalytic converter in automobiles. We have taken the unique properties of these catalysts and used them to create our Sophia stone. One of the most amazing properties is the catalyst's ability to consume a combustible without igniting it. This means that once the flame is blown out, it cannot ignite any combustible liquid or gas. What does this mean? It means that if out Sophia Lamp accidentally be broken, the catalyst is burning at too low a temperature to ignite the fragrance. Candles have a flame temperature of around 1700 degrees F. The stone burns at approximately one fourth the temperature of a candle. So, not only does our Sophia Lamp out perfume any candle, it is also much safer. On the first use of the Sophia Lamp, you will need to take the decorative container and remove the solid cap. 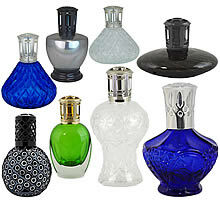 Pour you Sophia's lamp fragrance into the decorative container and do not fill more than 1/2 with fragrance. Over filling will cause poor performance and may even cause the stone to stop dispersing. After putting in Sophia's Lamp Fragrance, place the stone/wick into the decorative container. Now place the solid cap on the lamp. The wick now needs time to wick-up. This will take about 15 to 20 minutes. If you do not intend to use your lamp right away, then place the open air cap over the solid cap. This is the way you should keep your Sophia Lamp when not in use. 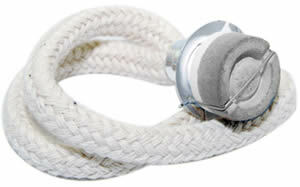 Once the stone/wick has had time to wick-up make sure both caps are removed. CAUTION: When lighting lamp, make sure you place it away from any combustible materials. Place it on a table with nothing close to it or above it. Never leave flame unattended. Take a butane lighter or match and light the stone. Hold the flame of the butane lighter to the stone until you see that the stone is producing a flame. Once the flame starts, let it burn for two to three minutes. You should notice a flame of 5 to 6 inches at the beginning. As the catalytic function of the stone begins to work the flame will get smaller. After 2 to 3 minutes has passed or the flame is much smaller, blow out the flame. Now place only the open-air cap over the stone/wick. Your Sophia Fragrance Lamp is now dispersing fragrance. Remember that the Lamp works after the flame is extinguished. The flame is to heat the stone and needs to be blown out after 2-3 minutes. The extended burner should last one to four weeks or approximately 250 lightings. Depends on how much you burn it. More fragrances and a extended wick show below for purchase.